OneDesk’s customer portal allows customers to provide feedback directly to your organization via your website, or a unique link. Once feedback is received, your organization can discuss the feedback internally, or with customers. You can also poll customers and ask them to vote on ideas they like best. Finally, bring the feedback into your OneDesk account to be worked on and keep customers updated on its lifecycle status. OneDesk’s new customer portal configurability options allow you to promote a positive customer experience. Customize your customer portal by choosing one of our themes, including a Facebook-inspired one, skins, colors or screen sizes that match your branding and website. You can also design your own. 1. Upgrade to a Pro account. 2. Choose one of our pre-made themes and colors here. Select a theme, skin and color to view what it would look like. 3. Call us at (514)731-6878 or 1-855-OneDesk (toll-free). 4. We’ll take it from there and do the work for you. Feel free to request your own themes and colors. 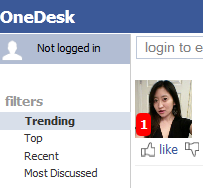 Above: OneDesk’s customer portal in the red Facebook theme, configured for a mobile device.